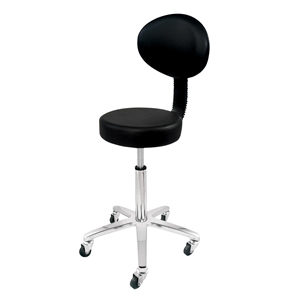 Deo Cutting/Beauty Technicians Stool with back rest. A gas lift black stool with vinyl seat and back and 5 star base with chrome finish. Please note seat height on this stool... Minimum Height measured from floor to top of seat 46cm approx, Maximum Height 62cm approx.